April 18, 2006 - I've never watched the anime version of Samurai Champloo and I can guarantee you that I never will. It's just not my thing. At least this game which is based on the series allows outsiders in, with its somewhat accessible storyline. There are plenty of nods to fans of the show with obscure references that only they would get but I didn't feel entirely left out. But at the same time, I was aware that there is an exclusive club - and thankfully I'm not a member. Perhaps I shouldn't judge the TV series on this game, but anything that blends ancient feudal Japan with hip hop culture has got to be kidding. I guess it's not much of a stretch from games like Samurai Warrior that use techno and scorching guitar riffs as the soundtrack to events that took place almost a thousands years ago, but come on, let's get some originality here. From what I can tell this show is just an excuse to throw together some extreme violence and adult-content while pandering to a teen demographic. The writing does seem to show signs of intelligence but just making things bizarre does not constitute brilliance or originality. What I see is a series that is a manufactured manipulating marketing fad. 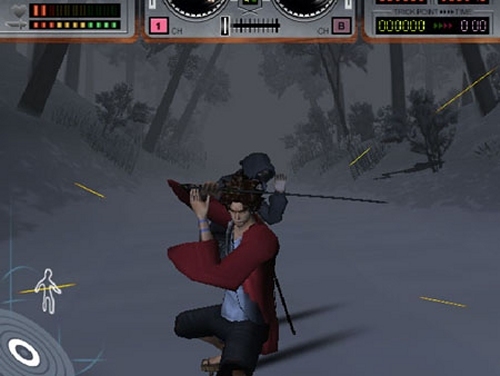 As a game, Samurai Champloo: Sidetracked, is just an amalgam of every run-of-the-mill hack-and-slash game. It's a poor imitation of games like Samurai Warrior and Onimusha. It relies on the basic hack-and-slash formula and is content to cover the well worn ground of previous games in the genre. The gameplay is straightforward and derivative. It's a textbook example of a button masher that throws seemingly endless waves of enemies at you, complete with the requisite boss battles after you've dismembered a few hundred enemies. Sure the game is challenging but it's also really boring. There just isn't enough to do and although the storyline is interesting, I could watch the TV show without spending good money for a game. What I care about is the gameplay, and although I can't complain that there isn't enough action, I can complain that the action isn't varied enough to hold my interest for 12 hours. Mugen and Jin are the two Samurais that you will control. They are indebted to a third party, a young cherub named Fuu. Mugen is an innovator and Jin is more conservative. The trio is an unlikely combination, with vastly different personalities, which is a hackneyed comedic device designed to generate cheap laughs and highlight some different combat techniques. The only thing they all share is an obsessive affinity for food. The two Samurai are compelled to protect Fuu on her quest to find the Samurai that smells like sunflowers. Her adventures will take her to strange lands which includes encounters with warring clans and mythical monsters. 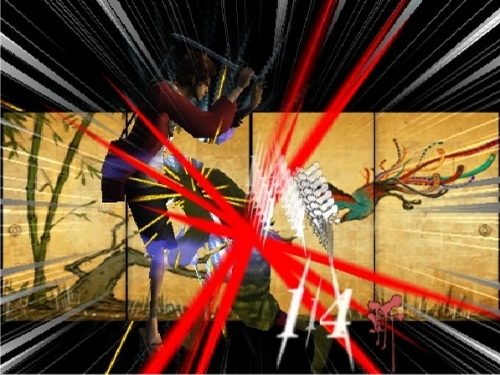 You can play as either Samurai and see the events unfold through their perspective. The story will play out differently depending on which character you choose and the path that you take. Jin's fighting style is simple with short attacks while Mugen favors a hip hop combat/dance style (groan) that incorporates plenty of combos. These combos are strung together with the aid of an attack tree which increases the power and length of the combos as long as you continue to execute them successfully. The Tension meter builds as you land hits but it will also go in reverse if you start taking hits from the enemy. If you manage to build the meter to the maximum level you will access the Hyper mode where your speed is increased three times allowing you to make 15 attacks in one second. In town, your character will visit the record store and purchase some disks which will contain the attack combos that will branch from the attack tree. Each track contains a slightly different combat style, and you can purchase more records for more attacks. Don't worry, it doesn't have to make sense. There are only two main attack buttons. One is for heavy attacks and one is for weak attacks. There is a modifier button but it's more cosmetic than anything else. It adds some pizzazz to your moves but you could play the game without it and that's part of the problem. The combat system lacks depth and that's not only the fault of the limited control system but the AI as well which doesn't put up much of a fight. Not only will you fight hundreds of generic enemies but there's a bonus mode which lets you fight another hundred enemies. Accomplish this and you will win a bonus item. The bosses are a little more interesting. You'll get to use more blocking moves as you ward off blows while discerning any patterns and waiting for the moment when they are most vulnerable. will get you sidetracked. I can appreciate the attempt at the humor in the storyline and I do like the way that things don't always make sense, as in a Monty Python kind of way, but as I said, I could watch the cartoon for free if that was all I was interested in. I would like to see that kind of eccentricity applied to the gameplay. Things would be a lot more interesting. The cutscenes aren't even all that great looking. The camera angles are fixed and don't always afford you the best view. Some of the character animations are spotty and there just isn't enough variation in the enemy character models. The characters are voiced by the actors from the TV series, the lip-synching is badly out of time, which is very distracting. I was so amazed at how bad it looked that I didn't even hear a lot of things the characters said. There are some laughs to be had but I really didn't find any of the characters endearing or interesting. Once you play the game through as both characters, you will unlock a third playable character. That sounds more like a punishment than incentive. How about let me complete the game once and then have it self-destruct and refund all of my money back? Including time wasted. It would be difficult to recommend this game to those that are not fans of the show. The only reason that some gamers might continue to play the game into the second hour is because it hints at a deeper combat experience. When you finally realize that most of your moves are going to be accessed by only two buttons with the occasional button-pushing mini games, it's likely to be game-over for most players. A missing episode you can't miss: Original storyline and world - a new experience that is unavailable with the TV series. Unravel the storyline in multiple ways depending on which character you select! If the TV show looked this weak then I would have finally found a cartoon that is worse than Rocket Robin Hood. It hints at greater things to come, but try as I might, I just can't seem to take a hint. The lips are out of synch with the voiceacting. The rest of the game is also out of touch with reality. Once you complete the game, you can torture two more characters by taking them through it. January 25, 2006 - If the names Jin or Mugen don't mean anything to you, but you're a fan of Cowboy Bebop, keep reading. Cowboy Bebop creator Shinichiro Watanabe has let his creative mind go wandering again and instead of settling on anime characters who go about their actiony business to the tune of bepop, jazz and blues music, he's come up with Samurai Champloo which mixes hip hop culture with historical samurai action into an anime program as eccentric as his previous work. But that's not all, anime fans! As you know we don't bother reporting on anime as a rule, so that must mean there is a game tie in coming! And what a tie in it is. Developed by the irratic yet genius minds who brought you Killer 7, Samurai Champloo: Sidetracked the PS2 game is being created under the watchful eye of Grasshopper Manufacture Studio and published by anime game favorites, Bandai. Since the anime is so heavily tied to music, this symbiotic relationship will carry over to the game as well. Jin and Mugen will hack and slash their ways through many different levels, all the while influenced by Combo Trees. A combo tree appears at the top of the screen as a PS2 face button combo (Square, Triangle, Circle, X etc) and if you complete it, it will lead to another and then maybe branch off. During the game you'll collect LP's (records...vinyl..you know?) which will give you even more combo trees to play with. Once a combo has been initiated you'll be able to transition into other modes of play such as Tate mode or Trance mode. Tate mode is button mashing goodness at its finest - keep busting combos and that will eventually open up Trance mode, which is a very visually stylistic mode that will unleash torrents of enemies in your general direction. Beat them all and you'll earn LP's that you couldn't otherwise locate. If it sounds bizarre and confusing, don't worry. I'm a little perplexed myself. I think it's one of those games that you're just going to have to experience before it all begins to make sense. As far as playability or incentive to keep playing, Mugen and Jin will both have their own distinct move sets and combo trees. Jin is the more traditional samurai who will depend for more on his sword skills than his break dancing moves, while Mugen will rely on flashier fighting skills involving Capoeira type attacks as well as swordfighting. Those familiar with the show will recognize Fuu, a female character who is largely in the role of comedy relief. Fuu will also be a playable character in the game but interactions will revolve around some amusing mini-games such as eating as many sno-cones as possible. There is also a rumored secret third character who will be available in story mode, but we do not yet know if this Fuu or another character. Samurai Champloo: Sidetracked promises to be a long game - with each characters story weighing in around the 6 hour mark. If there are three playable characters in story mode, that's 18 hours in total. With constantly changing combo trees, the replay value could be even higher.